How right he is. We are all lead to believe that Google, Facebook etc are altruistic organisations that simply exist to provide us with a free service. The truth is they are big businesses that exist to to make money. By sharing the information we willingly provide them with, these companies get rich and fat. At one time, they would rely upon pushing adverts from interested parties to us as a means to gain revenue. Now they are going a step further by collecting information from us to disseminate to others in exchange for payment. When Google talk about the benefits of their changes in policy to users, they mean their paying clients – not us. We are no longer the customer with rights, we are (as Pete says) the product that they sell to others. There was a time when you bought a phone to be a phone, a camera to be a camera etc etc. Not any more, the technologies are converging to allow us to buy one device that does everything bar making the cup of tea that I desperately need right now. High in the ranks of this “one for all” approach is the Apple iPhone. Sure it is still a phone but much more than that, it is a camera taking both stills and video, a game machine, a music player, a personal information manager, a web browser, a GPS tracker and for all I know a whole lot more via the readily available apps. To a certain extent, the iPhone is a Jack of all trades and master of none. For example, internet browsing on a phone is not the best way to view the web. It is the same issue with our new “smart” TV. Without a keyboard and a mouse (or track pad), navigating your way around the net can be a slow and tedious process. It is the same with the built in camera on these phones. Upping the resolution to millions of megapixels only serves to make matters worse because the inherent problem is always going to be the size of the sensor that records the image. In the slim confines of a phone, the sensor is tiny making each pixel site miniscule. Small pixel sites equals noisy images in anything but bright light. Processing the noise out, reduces the resolution so it is a Catch 22 situation. This morning I found an advert from an American company who take the concept of the iPhone camera a step further into the absurd by marketing lenses you can attach to your phone to increase the zoom to 6x, or to give you wide angle shots (including fisheye) and even turn it into a microscope. Those of us who have dabbled in photography for awhile know that add on lenses, no matter how well they are made, degrade image quality. On a device that already has limited image quality, that is not a good thing. In any case, smart phones are already cumbersome to carry, imagine carrying a supplementary lens or two in your pocket as well. I don’t want to appear to be a luddite but I think I will stick to using an orthodox camera to take my pictures thank you. David, who is soon to marry my daughter Laura, bought himself a Spain away shirt after they had won the World Cup in 2010. Although he liked the red shirt, the navy blue appealed to him more and I agree with him. Being a practical colour, Dave wears the shirt a lot and it suits him. National teams like to change their shirts from time to time and so Spain has introduced its new away shirt for the forthcoming European Championships. Usually, the changes are subtle but not this time. The new shirt is pale blue with a dark band across it to highlight the badge and has the words «campeones de Europa 1964/2008” embroidered on it. I know David will not object to the design, nor the inscription but the colour, that is a different matter. You see my son in law to be is an avid Manchester United fan and therefore approves of anything red. On the contrary, United’s arch rivals Manchester City play in light blue and so he hates that colour. To those of us who are not aficionadas of the beautiful game, this might seem a little ridiculous but that is the way it is. Sorry Spain but I know that David will just hate the new away shirt and will stick to the dark blue one he has already. Never mind the colour, at 80 Euros apiece, I don’t altogether blame him. PS Thankfully, Dave and Laura’s first child was not a boy otherwise Dave might have had to endure his offspring wearing lots of pale blue clothing. For those of you who might be interested, you can now find the other photos I took of the Concierto del Socio here. Many thanks to Germán Martín at the Auyuntamiento for hosting them on the town’s server. I apologise for the blurring on the photos of Pepe presenting the diplomas. When you realise that these were taken at shutter speeds of 1/8th of a second, it is kind of understandable. Taking pictures with a 200mm lens handheld at those speeds is only possible because of Canon's fantastic image stabilisation system which prevents the effects of camera shake but can't stop blur due to subject movement. Pepe is very good because he pauses for a moment to allow a photo to be taken but the recipients don't always follow. When you want to find something out, you turn to Google, it is the biggest and most efficient search engine out there and not only that but Google offers very useful software and apps that make out digital life a lot easier. This blog is hosted by Google and I use their Chrome browser almost exclusively. Information that you give us. For example, many of our services require you to sign up for a Google Account. When you do, we’ll ask for personal information, such as your name, email address, telephone number or credit card number. If you want to take full advantage of the sharing features that we offer, we might also ask you to create a publicly visible Google Profile, which may include your name and photo. We may collect device-specific information (such as your hardware model, operating system version, unique device identifiers and mobile network information, including phone number). Google may associate your device identifiers or phone number with your Google Account. When you use a location-enabled Google service, we may collect and process information about your actual location, such as GPS signals sent by a mobile device. We may also use various technologies to determine location, such as sensor data from your device that may, for example, provide information on nearby Wi-Fi access points and mobile towers. The spokesperson for the socialist party, Raúl Valerio Medina has echoed complaints from some of the residents at Villas Andrea. The main issues seem to on Calle Alemania where people are complaining of sewerage odours. Some of the houses are now empty and that seems to be the cause of the problem. Sewerage pipes in the street are of course the responsibility of the council. Whilst we are on the subject of waste, one of our neighbours was told categorically by Aurelio Murcia that the item on our water bill for “basura” should now be 35 Euros and not the 50 Euros we have been paying since moving here. I can assure the councillor that it not the case, our recent bill from Aguagest still shows 50 Euros. And just to round off, we should mention the problem with the storm drain on Calle Le Vigan which spills out onto the road during heavy rain creating a river of yellow water down the road. We are all aware of the huge debt that Bigastro Town Hall faces, however that is not of our making. In Bigastro, we pay the highest council taxes for this area, we do expect something back in return! There is an exhibition, currently on at La Lonja in Orihuela, that shows how changes in fashion have liberated women. First off the hat – at the start of the century, no respectable woman would go out without a hat on her head. The more adorned it was and the more uncomfortable it was, the better because it showed your status. Secondly the corset – best described as an instrument of torture. It was designed to reshape the figure and lift the bust. At the same time it severely restricted movement. My grandmother wore one for most of her young life. Women these days only wear hats to weddings and Ascot and as for the corset – well that is mainly worn by ladies offering “special services” to men with a penchant for that sort of thing. * Fancy my wife’s parents naming her after a broad brimmed Spanish hat! When musicians are enjoying themselves, their performance is so much better. Clearly, the Bigastro band were taking great pleasure from the music last night. They started with an immaculate performance of 1492 by Vangelis and then played El Caserios by Jesus Guridi. For the second part of the concert they started with El Quijote, a piece for band and narrator by Ferrer Ferran. They followed this with a selection from Phantom of the Opera by Andrew Lloyd Weber and finished with El Relicarion by Jose Padilla. Mateo Marco Amoros narrated the tale of Don Quijote. He spoke so clearly, we could mostly follow what he said. Asuncion Galvez Mesples sang the selection from Phantom of the Opera. Her voice is like crystal with perfect pitch. Makes the hairs on the back of your neck stand up. I’m betting there were quite a few people went to the beach yesterday or sunbathed in their gardens. If you found a sheltered spot, it was really pleasant out in the sun. But then as the sun started to go down, they would have been looking for a sweater to keep them warm. You can see the fluctuations in temperature recorded in Orihuela. The best period was between midday and about 6pm, then the mercury dropped quickly. There was a party going on up at La Predera with a lot of people coming and going and a disco to keep them happy. After a cold winter of being inside, it was nice for them to be able to get out and enjoy some fresh air again free from the smell of wood smoke. Last Saturday, the 7th Gala de la Música Vega Baja y Baix Vinalopó was held in Orihuela. This event was organised by the Federación de Sociedades Musicales de la Comunidad Valenciana (FSMCV). Each of the 13 musical societies attending, presented diplomas to chosen members for their outstanding contributions to music. La Sociedad Unión Musical de Bigastro presented their diplomas to D. Joaquín Grau Murcia, Lieutenant Colonel Director of the Military Music School in Spain and to D. Joaquín Sáez Belmonte, a musician in the band who has recently finished his higher level studies for the saxophone. After the presentations, the participants retired to another room for a meal where they held a raffle for various prizes. Students from the Estefanía Selfa School of Dance will be performing for us on Saturday, 3rd March at 6:30pm in the Auditorium. Looks like they will be performing in a mixture of dance genres; classical, Spanish, funk, bolliwood and boody compat (not sure quite what that is, I think it might be belly dancing). It seems my information was correct, there will be a concert tonight in the Auditorium at 6:30pm as you can see from this poster. The newspaper, Público tried to take on El País when it was launched in 2007. It was aimed at a young audience but also found favour with the older generation. However, it was too close to the socialist administration of the former prime minister, José Luis Rodríguez Zapatero for the newspaper El País and so they were rivals. Público apparently needs 9m Euros to continue printing and has failed to find an investor willing to put up that sort of money. Sunday’s edition could be the last one. It will continue online though in a web based version. There is now only one left wing national newspaper. With four titles representing the right wing, it looks like the Conservative PP have won not only the general election but also the voice to the nation. Having not seen any publicity for the concert to be held in the Auditorium Francisco Grau on Sunday, I went to the Bigastro web site this morning just to check but unfortunately it seems to be experiencing some problems. I am assured by our teacher Antonio that there will definitely be a concert on Sunday at 6:30pm and on this occasion it will be free. If I see my neighbour Pepe, I will check just to make sure I have this right. Moving on, I also understand that Percuseve are in the process of preparing a new production, Ritmos sobre lienzo "Rhythms on canvas" which is due for its first showing in April. Those of you who have seen previous productions by Percuseve; Ritmos de papel, El ritmo del tiempo and Ritmografía de una vida will be looking forward to this new work. The Percuseve group is made up of 25 secondary school students from C.E.S Severo Ochoa de Murcia. The group rather cleverly transform every day objects and even their own own bodies into musical instruments and have taken this form of music and developed it into making social statements. Their first project, El ritmo de los tiempos, represented the evolution of technological development from prehistory to the present time. The second project, Ritmografía de una vida, was an x-ray of the present society through theatre, percussion, hip-hop and break-dances. It touched upon subjects like: education, solitude, sport, work, risks, el botellón and the conflicts we perceive in helping people with incapacities. The third project was Ritmos de papel in which the group looked at the present education system. It was also a form of homage to Miguel Hernández and included poems by the great author both recited as sung as rap. As I said the present work is Ritmos sobre lienzo - a story about the great Murcian painter, Ramon Gayo. So the theme this time is painting. I will let you know when I have a date for its showing in Bigastro. Mr Brown hasn’t been to see the doctor for awhile! I remember hearing of schools in Liverpool that tried to claim for pupils that did not exist, I did not expect to find doctors in the UK trying the same trick. An article in the papers today says that there are 55 million patients registered by doctors in the UK. With an actual population of 52.5 million, that means there are potentially 2.5 million ghost patients in the system. These are people who have moved house, left the country or are dead – in some cases for up to 40 years. I thought it was only the Greeks that claimed pensions for dead people, now it seems that doctor’s surgeries in Britain do the same. At £65 per patient, the potential wastage is £162 million a year. In many cases it will just be a matter of neglect or the patients haven’t bothered to de register themselves. How are the surgery to know that a person has died or has moved house unless someone tells them? Still, at £65 per patient per year, there is not a lot of incentive for the doctors to chase these matters up. Police in Torrevieja have busted a gang of ten who were selling drugs in one of the parks. Amongst the ten were three children who were used as couriers. The modus operands was familiar; members of the gang would act as sellers, others would deliver the drugs and yet a third party would collect the money. During the raid, the police seized cocaine, heroin, marijuana, "speed", tranquilizers and hallucinogens along with two vehicles and 726 Euros. Near the entrance to our estate people arrive in cars supposedly to meet up for a chat. Apart from the litter that they leave, it does make you wonder if there is some other purpose to their visits. Why would people take the trouble to come out of their way to an isolated spot just to chat? Why not just go to each other’s houses? Every now and then a police car will patrol the area but with a clear view of the road up to the estate, they can be seen arriving well in advance. Opera 2001 will be performing Puccini’s "La Bohème" at 8:30pm on Saturday in the Teatro Circo de Orihuela. This famous love story between a seamstress called Mimi and a poet called Rodolfo is set in 1830s Paris. The pair almost immediately fall in love with each other. Rodolfo later wants to leave Mimì, supposedly because of her flirtatious behaviour. In fact, it is because Mimì is very ill, and Rodolfo feels guilty, since their life together may have worsened her health even further. They reunite for a brief moment at the end before Mimì dies. A story with a sad ending! Tickets cost between 18 and 22 Euros; students rate 9 Euros and a 5% discount for large families. Our teacher Antonio told us yesterday that he would be going. We all want our technology for less which is why the manufacture of much of it takes place in countries like China and Taiwan where labour costs are low. This does raise cause for concern in certain quarters because people do have a conscience about these things until they get to the shops that is. Nike came under a lot pressure in the 1990s for using cheap labour in the far east to produce its goods. Now it is the turn of Apple to face the same dilemma. Apple uses Foxconn plants in China to assemble iPhones, iPads, iPods and computers. Staff in the factories work for six or seven days a week, for up to 14 hours a day to earn 1,800-2,500 yuan (217 – 302 Euros) a month. However, it isn’t just Apple that Foxcomm produce for; Xbox 360 video game consoles for Microsoft, and computers for Dell and Hewlett-Packard are also produced at their factories but the pressure at the moment is on Apple because of its success. Of course, if we feel so bad about it, we could return to sourcing components from countries where working conditions are more acceptable but then what price would we be paying for that new mobile phone or that laptop? In any case, Foxcomm employs 1.2 million Chinese in its factories. How would they feel if we stopped buying the products they produce? Apart from the advances in processor power, it is the price of RAM (the memory all these devices use) that has driven computing forward. In 1973 12 Kb of RAM would have cost you 4,680 US $, even in 1985 2Mb would have set you back 699 US $. Now you can buy 2 x4GB of RAM from Newegg for 39.99 US $. Remember there are 1024 Kb in a Mb and 1024 Mb in a Gb so you can figure out what 8Gb of RAM would have cost in 1972 – I will spare you the maths it would have been 3,271,557,120 $. Where goods are produced and the price of RAM reflects in the price we pay for our technology. Back in 1981, a Model A BBC computer, cost £235 with 16kKb of RAM and a 2Mz processor. Storage was via a tape cassette or a floppy disc drive. Today you can buy a Dell Inspiron for £269 with a 2.9Gz processor, 4Gb of RAM and a 500Gb hard drive. Components made in the Foxcomm factory of course! I think we can safely say that the mass rallies that took place on Sunday in cities like Madrid and Valencia were just the tip of the iceberg to come. I would not be surprised to learn of a call for a general strike in the country sometime soon. The protests at the weekend were about the government’s plans to make it easier for employers to fire workers and to introduce wage cuts. The labour reforms are meant to create jobs and and reduce the 23% unemployment rate in the log term. However, the economy is set to shrink by 1.7% this year and even the government expects the unemployment rate to increase in the short term. From the workers perspective the moves will only serve to worsen their situation, we all understand that. However, the fact is that employment in Spain was stagnant. It was very hard for companies to fire people and when they did, the redundancy payments they had to fork out were crippling. That might have suited those who were employed but meant that companies struggled to keep their completive edge in the European market. They were also unable to create new jobs for the young people fresh into the job market. By comparison with countries like Germany, Spanish workers were overpaid. During the boom years when the economy was buoyant, Spanish workers enjoyed pay rises which far exceeded their European counterparts. In present society, we have all come to expect more; to be now told you are going to have less is therefore a bitter pill to swallow. There aren’t a lot of choices open to Spain if it wants to regain its former economic stability, maintaining the status quo is no longer an option. I read in the paper today that the Association of Relatives of Patients suffering from Alzheimer’s, 'Remember Me' in Bigastro has signed a collaborative agreement with the Social Work of the La Caixa Bank to carry out the second phase of its Family Respite Unit for dependents. The donation of 12,000 Euros to the association will ensure the permanence of the unit which was set up last year in the Integrated Social Centre. That is wonderful news, well done all those members of the Association and especially our neighbour Eladia who is of course one of them. The audience of children from the municipal sports school had plenty of questions to ask Sergio Mantecón and Cristóbal Márquez from Elche Football Club on Monday. At the end of the chat, there was a raffle, the players signed autographs and had their pictures taken with the children. The players then invited the children to watch the match against Recreativo Huelva next week. To thank them, the players were presented with two boxes of lemons courtesy of "Perales and Ferrer-La Perdiz". In spite of the cold, hundreds turned out yesterday to take part in the costume parade in Bigastro. Many came as individuals and others came in groups. The gymnastic club, the tennis club, the basketball club and the football club all came out in force and put on a great display. Spain has to make 40bn Euros of adjustments in this year’s budget. The government has already found 15bn Euros by means of cuts and tax rises but there is still a lot more to come. Last week, the Government announced that the golden handshakes to executives from the banks taken over by the state would be cancelled. The 1m Euros that the executives had approved for themselves if they were laid off outraged many Spaniards. Executive pay to nationalised banks was also capped at 300,000 Euros and to those that had borrowed from the state to 600,000 Euros. This means the Rodrigo Rato, chairman of the Bankia Bank will have suffered a 75% pay cut. The fact is the recession in Spain was caused in part by a housing bubble pumped up by loans from the banks that now need taxpayer help like the Caja de Ahorros del Mediterráneo and the Caja Castilla La Mancha. Now, in a further measure, the pay for executives in state-owned and partly state-owned companies has been cut by up to 35%. For the smaller public companies, salaries have been capped at 80,000 Euros and 55,000 Euros including perks. The number of directors of these companies has also been curbed. Reading this in conjunction with the stories about British bank executives awarding themselves huge bonuses even though their banks had to be bailed out by the government makes you realise that banks are the biggest thieves in society. The notion that they have to award obscene salaries and bonuses to attract the right people does not sit well with the ordinary investor who has seen the value of his savings drop because of miserly interest rates. These people ‘play with our money’ and lose it because of bad investments but still expect to be paid their high salaries. It’s a bloody cheek if you ask me, I cannot feel one bit sorry for them. Although the proposed strike by chemists in December was called off, the situation that led to this desperate measure still exists. Chemists are still not receiving payments from Valencia for the drugs they dispense. In desperation, they have requested that the Government intervene and take over health matters from the cash strapped region. Now we read that many health centres in the region will be closed at weekends as part of the cost cutting measures. The Health councillor says that it will be those centres where patient numbers are low on Saturdays that will close and that they would be open for an extra hour, Mondays to Fridays to make up for it. Whether this affects the health centre in Biagstro or not, I can’t say. I do know that last summer the air conditioning in the centre was shut off to save money. In a press conference, Raul Valerio, spokesperson for the PSOE in Bigastro, referred to Aurelio Murcia as a partner in the company Andreas Villas which he said owed money to the Council for construction work in 2004. Just to clear up this misunderstanding, Ginés Ruiz, one of the three directors of Andrea Villas, told the newspapers that Aurelio Murcia is not a partner in that company. He pointed out that there are two court rulings that highlight this fact. He said that he was doing this because he would not want any misunderstanding that could aversely affect the company. If you lived on Calle Irlanda, then you would have been well aware of the bad blood that exists between the two ex partners. The house that Murcia lives in was built by Star Sol and so, when the company was in financial difficulty, Ruiz tried to force him out of it; even resorting to having the electricity and water cut off and the gate to the parking area rammed. Eventually, the courts ruled that the house was constructed for Murcia as a “gift” from Star Sol and therefore he could continue to live there as he still does today. I am a keen internet shopper. From the comfort of my home, I can research and find those things I want to buy without hassle. I can take my time and plan my purchases. It beats getting in the car, struggling to park and battling with queues in a shop only to find the goods you want are out of stock. There is a downside though. When you go to a shop and buy, you get instant gratification. You come home with the goods in hand. Buying on the internet incurs a delay as you wait for your order to be processed and then dispatched. A lot of UK companies say, if you order before a certain time, then you will have the goods next day. That is almost the same as going to the shop. Living in Spain, delivery from the UK does take a little longer but where companies use a courier, that is only a matter of a couple of days. I would expect ordering directly from Spain to be a lot quicker and I am sure with most companies it is. There are always exceptions though and one such is Carrefour Online. Ordering from them has been the worst Internet shopping I have ever experienced. It has been worse than my orders with Simply Electronics and they were bad! I placed an order with Carrefour Online on the 7th February and received an email telling me that the order had been placed satisfactorily. On the 9th I received a further email telling me that I needed to send copies of my passport, my credit card (showing the last four numbers) and a signed note authorising them to use the card to pay for the order. I sent the copies back straight away but had to wait until the 14th before my order was finally being processed. At that point I thought it would only be a matter of a day or two before the courier was ringing the bell at the gate. How wrong I was, it is now Friday 17th and my order is still being processed. Even if the order is dispatched today, it will probably be Tuesday 21st before I receive the goods. That means it will have taken Carrefour a staggering two weeks to fulfil my order. I suppose I should have been aware of the clues, "available in 6 working days" clearly means they don't have stocks to hand but get them from distributors as and when they receive orders. My advice therefore is NOT to use Carrefour Online if you want something anytime soon. Instead order form El Corte Ingles who do have stocks and promise next day delivery. The Costa Blanca News recently warned its readers about scam emails and now the British Embassy in Madrid is echoing that warning. The original scam email that the newspaper unveiled said it was from HM Customs and Revenue requesting bank details in order to pay a tax rebate. And now a further email doing the rounds supposedly comes from the Spanish tax office (Agencia Tributaria AEAT). Neither are of course genuine. The third type of scam are emails asking for urgent funds to be sent to help friends or families in distress. Unfortunately, these email scams are becoming common place and are largely targeted at ex-pats. The advice provided by banks is never to give your banking details via email. Since neither HMRC nor AEAT have my email address, it would be extraordinary for them to contact me and I know my bank will never contact me in this way. However, I was asked recently to send a copy of my credit card by email. Since the company only needed the last four digits to confirm the details I had given them via their secure site, I carefully erased the other numbers so they were totally illegible. If I hadn’t the software on my computer to do this, I would have covered them with a piece of paper. Sadly, there are some very unscrupulous people out there determined to try and con us out of our money by any means at their disposal. It is up to us to make sure they do not succeed by applying common sense when using the Internet. If your PC crashes for no apparent reason, you keep receiving error messages and don't know why your PC runs much slower than when you first bought it, the chances are you have a problem with your registry. I personally use TuneUp Utilities to keep my PC happy but here is another product which might work well for you. I would not have this in my house! The work by the artist, Eugenio Merino shows the Spanish dictator, Francisco Franco set inside a fridge. Merino says "Always Franco" is meant to be a comment on how the former dictator continues to make headlines in Spain and adds, "It represents the idea that in Spain people are keeping the image of Franco alive. We don't stop talking about him, debating about him. A fridge is where things are kept alive and fresh". The piece is currently on show at the ARCO art fair in Madrid. If you want it, then the Barcelona-based gallery ADN will sell it to you for about 30,000 Euros. Previous works by the artist include a sculpture of the British artist Damien Hirst shooting himself in the head and "Stairway to Heaven" which depicts an Arab man on his knees praying, with a Catholic priest on the Arab's back also knelt in prayer and a Rabbi in turn standing on the shoulders of the priest. I understand that, if Damien Hirst shot himself, his works would increase in value but does he or we need to be told that? Don’t get me wrong, art has always courted controversy as a theme but usually in a more acceptable form. I think you could say that I don’t care for either of these! Aurelio Murcia, who is in charge of Town Planning in Bigastro, has once again challenged the ex mayor, Raúl Valerio Medina by asking him to explain why two of the five outstanding bills for work to improve irrigation pipelines in the town were not paid. He says that the money for this work came from the Generalit in Valencia and should therefore have been paid to Pavasal, the company that completed the reformations. The Councillor also denies that Villas Andrea owed money to the Council and points out that, if that had been the case then it should have been dealt with in 2007 when Valerio was in charge of finance. He says that the ex mayor is lying and making up debts that do not exist. To use a tennis analogy, I think the score is now 30 – 15 with Murcia scoring two aces so far. The Carnival Parade in Torrevieja is almost a must on our calendar but this year we have missed it. There are two parades, one in the afternoon and one at night. The night parade starts at 10pm so we normally would go to the daytime one but that took place last Sunday when we were otherwise engaged. Reading about it in the Coast Rider, it sounds like this year’s parade lived up to the usual high standard with 30 comparsas taking part. It was apparently very cold though, especially for those dressed in next to nothing. I expect performing the elaborate dance routines helped to warm the participants up a little but it would have been cold for us standing there for over four hours. I read in the Guardian this morning about a town in La Mancha that has reintroduced the peseta but just for one month. There are still millions of pesetas in circulation according to the Bank of Spain, lots of people clung on to them when the country changed to the Euro in 1999. The move has turned out to be profitable for local businesses because people from around the area have taken the opportunity to visit Villamayor de Santiago to spend their old currency. At the end of the month, the shopkeepers will take the pesetas to the Bank of Spain in Madrid to exchange them for Euros. Since the rate of exchange was set at 1 Euro = 166.386 ESP, they will have large bundles of notes to take with them. It was entirely predictable that the combination of traffic going to the market in Orihuela and the work on the high speed train line was going to cause chaos in the area of the Recinto Ferial and it did. That was the reason why the local council proposed moving the market to the area around Ociopia. The market traders objected to the move and so, yesterday the market reopened in its original location. Pam and I have only been to the market twice at the Recinto Ferial and twice was enough. To find a parking spot, you have to be there early and we don’t do early anymore. Go at a sensible time and it is a devil of a job to find somewhere safe to park your car. And that was before work started on the high speed train line. Yesterday was apparently a nightmare with traffic crawling along the roads, especially the routes from Callosa. It will be absolutely awful for those people who live in the area, I imagine they won’t even bother trying to move their cars on Tuesdays for the next two years. On Saturday 18th February, to mark the last Saturday of Carnival, the Merchants Association in Bigastro and 15 of the bars, cafes and pubs are organizing a costume party in the town with a cash prize of € 300.00 along with various gifts which will be delivered on Sunday from 4:30pm onwards. 1. - To be eligible, you must be in disguise and buy a drink in at least 5 of the 15 bars participating in the contest. They will then stamp your card in one of the five spaces. 2. – All the bars will have a box in which you can place your completed card. 3. – On Sunday February 19th from 4:30 pm, the various draws will take place in the bars. My friend German, from the Ayuntamiento, tells me that the parade will take place at 5pm, Saturday on Calle Purisima. PS That very much sounds like a great photo opportunity for El Willo! See you there. El Altet airport at Alicante had 10% fewer passengers in January compared to last year and 20.2% fewer flights. Cargo flights also dropped by 10.9 percent at El Altet. The biggest problem for El Altet has been the loss of flights by the budget airline, Ryanair who cancelled 20 routes from the airport because of the instance by Aena that they must use air bridges to load and off load passengers. Summer looks as though it could be even worse because Ryanair threatens to cut 300 flights per month during the peak period. To put these figures into perspective, flights to and from Spain during January dropped by 2.9% overall in comparison with last year. Defending his position as ex mayor of Bigastro, Raúl Valerio Medina accuses the present government team of colouring the truth in their comments to the papers because they would have been aware of the debt of 376,000 Euros of which 80,000 Euros was interest because it was included in a report prepared last October. To be fair, whether they knew previously or not is kind of a mute point. Medina goes on to say that part of that debt occurred because Andrea VIllas, the company that Aurelio Murcia was part of, owed over 65,000 Euros to the Council for work constructing 180 houses in 2006. In his report to Informacion , he acknowledged the claim by the company Idearco of 7.5 billion Euros for losses related to the building of an apartment complex at La Pedrera. Finally, Medina maintains that the actual debt of the town is 17 million Euros and not the 31 million claimed by the PP/UNPLC. Now we all know that over exaggeration is a trait that politicians specialise in and 17 million sounds a lot better than 31. However, even if Medina’s figure is correct, for a town of 7,000 people it is still a hell of a lot of debt. Visitors to Orihuela in recent weeks cannot have missed the piles of uncollected garbage that have strewn the streets. The problem was caused by workers, on strike because they had not been paid. On Friday, the strike was called off and the rubbish started to shift but that has now caused a further problem. Garbage from Orihuela used to be collected by Proambiente, the company owned by Angel Fenoll and was dumped near to Crevillente. The new contractor has nowhere permanent as yet to offload the garbage and so is dumping the waste at a site near to Villamartin which is intended only for garden waste. Naturally, the local residents complained and so the Guardia Civil from Guardamar were called out to investigate. It is surprising how much money there is to be made from garbage collection. However, having it dumped on your doorstep does not make you best friends with the guy bent on making his fortune this way. You hear so often about the problems caused by young people in England drinking to excess at the weekends, the so called “binge drinking” and assume that this is peculiar to our native land but apparently that is not the case. This morning I read about similar problems in the small hamlet of los Palacios, near to Formentera del Segura. Apparently weekends in the pedania are a nightmare for the local residents. It all starts with chairs being taken from the local bars, cars coming and going and a throng of young people congregating in the streets where the bars are located. The car doors are left open to provide a mobile disco and then the party starts. The noise and the revelling carries on until the early hours of the morning. On Fridays and Saturdays the bars close at 3:30am so that is about the time when things start to quieten down. It isn’t just the noise levels though that people complain off, it is the fact that the streets are littered with bottles and glasses and the stench of urine which lingers permanently in the air. That is not what you would expect in a sleepy little Spanish hamlet. People have complained to the police and the town hall. In 2006 the area around the bars was declared to be “acoustically saturated”, bar licences were revoked and regular patrols by the Guardia Civil were instigated. Since then though, the problem has got worse. There are more bars and therefore more people and more noise. The local people have asked for a greater police presence with constant patrols rather than just the odd car driving past. Some have even decided to try and sell up. Fat chance they have of doing that! It isn’t just in Formentera where this problem exists, visit any Spanish town or city during the early hours of Saturday and Sunday morning and you will likely find a similar scenario. It might be convenient to have a flat in the centre of a town but it certainly will not provide you with a quiet life. For that you need somewhere outside like Villas Andrea. Even here though, we suffer from groups of young people carrying their bags of bottles up to La Pedrera to party in the summer. You have to be sound asleep not to hear their noisy return to the town in the early hours of the morning. Some say the problem has been worsened by the high levels of youth unemployment; I’m not so sure about that. Perhaps I am wrong, but I believe this is a social phenomena brought about by modern attitudes gleaned from American television. Like the introduction of junk food into the Mediterranean diet, it is the inevitable McDonaldisation of the world and the spread of American culture across the globe. It's as welcome to older Spaniards as the law preventing smoking in public places. I have told you before about our neighbours and how delightful they are. Yesterday we were privileged to enjoy a meal with them in their beautiful house across the road. Armed with a bottle of wine, we made our way across at the appointed time and were greeted by the two dogs, Luka and Nero along with the daughter who has the same name as her mother. It is apparently quite common here to call a child by the parents name. From the kitchen, we retreated to the dining room where the table was beautifully set out for us. At the table were Pepe, Eladia, Eladia (the daughter) and her boyfriend Quino (I have probably spelt his name wrong). As I said, the first course or entradas were mariscos served of course with bread, olives and crisps. Then came the paella which was served on its own but with alioli and a squeeze of lemon to garnish it. There was also a bowl of lettuce of a type that you find typically at this time of year. See the finished dish here. For the dessert we had a special pudding that Eladia has adapted from a German recipe. I could best describe it as being similar to bread and butter pudding but with the addition of cinnamon which is a very popular spice here in Spain. It also had layers of apple and a squeeze of lemon inside. Certainly it went down well leaving just sufficient for them to have today. We rounded off the meal with coffees and brandy. Pepe was clearly in a relaxed mood because he followed his brandy with with a couple of gin and tonics. A memorable meal in the company of wonderful people. Many thanks to Pepe, Eladia, Eladia and Kino for making our Sunday so special. This time though it is not the Moors trying to capture the city, it is plants and insects. Apart from rats, mosquitoes and cockroaches; the invaders include the processional caterpillar, the red palm weevil and the Arizona cactus. Lat year the Environment Department spent 192,000 Euros controlling pests added to which the Health Department spent morey controlling rats and cockroaches. 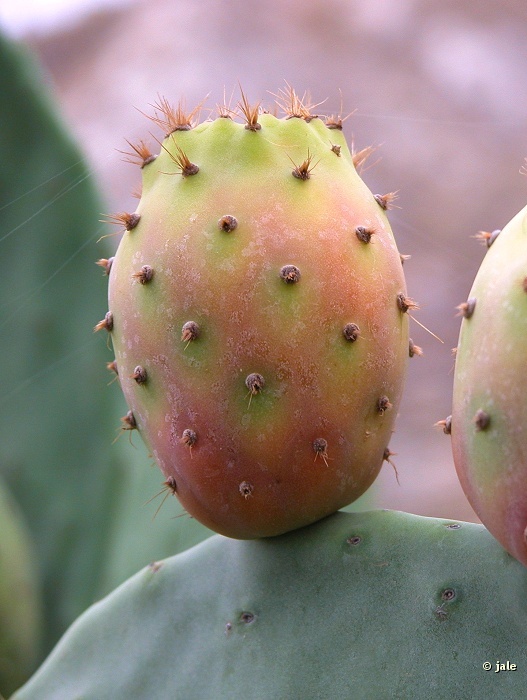 There are also problems with the paleras that produce chumbos figs, chumberas and agarves* which are being attacked by cochineal beetles that lay white grubs in them. These are not native plants and so are not on the list of protected species. NB You’ll find paleras growing on the side of the road down into the town just before the water station. Once the fruit are ripe, peel the skin off to reveal the sweet flesh inside. The fruit of the palera is sweet. However, the major challenge for Orihuela is the red palm weevil because it is in danger of affecting the unique palm forests of the area. A trip along the road to Los Montesinos will show you what happens to palms affected by the beetle. Last year, 36,000 Euros was spent on spraying trees in Orihuela and a further 13,600 Euros on felling affected specimens. * We had that problem, the plants just pulled out of the pots leaving a disgusting sweet odour. As dug out the soil, I could see it it was filled with fat white grubs. The ex mayor of Bigastro, José Joaquín Moya is now being accused of misappropriation of public funds, fraud and extortion. These accusations all relate to the mystery of the VW Toureg which was supposedly given to the mayor as a gift. In fact it transpires that the SUV may well have been bought using public money. It seems that 14 payments were made to the company Torrebir amounting to 117,000 Euros supposedly for work done in the municipally. However, some of the payments that total 60,000 Euros look as though they could have been used to buy the luxury vehicle instead because no evidence has been provided of work done to justify them. No doubt, the fact that there was no proper records for these payments, will be described by the accused as “simple errors”. The more you read, the more you discover there were a number of “simple errors” in the Bigastro system of accounting. Also implicated in this are the secretary and treasurer at that time, Antonio Saseta and María Carmen Grau because, they along with mayor, would have signed the cheques and the two businessmen, Manuel Nortes and José Almarcha. These people have all been called to give evidence on the 23rd February. Francisco Camps and Ricardo Costa received ‘not guilty’ verdicts in the long-running Gürtel case which involved corruption in the PP regional governments of Valencia and Madrid but Judge Baltasar Garzón did not fare so well. He was found guilty of recording the conversations as he attempted to prove some lawyers were involved in money laundering. The supreme court said Garzón not only illegally wiretapped the prisoners' conversations but committed a second crime by doing so in the full knowledge that he was breaking the law. That might be true but other investigating judges have used the same methods without facing charges. Although, Garzón’s supporters admit he might have overstepped the mark, they claim that this was a conspiracy against the judge and the punishment was harsh. As a running sore to the PP, he had to be dealt with and that is what they have just done. Over the years that I have had internet connections, I have bought hundreds of items online from scores of different companies – it is my favourite way of shopping! The process is usually quite straightforward; you create an account with your email address and a password, provide the address that your credit card is registered to and then you are ready to go. All you need to do then is to enter the credit card details; name to which it is registered, number from the front, expiry date, the security number from the back and the order is complete. The online seller can verify that all is kosher and at that point you can sit back and wait for the friendly courier to bring the goods to your door. Of course there is a lot of fraud going on out there so it pays to be vigilant about the sites you use and make sure that the site is secure (https). It is reassuring when companies use the Visa security systems where you have to enter further details from a password to complete the transaction. However, things are not always that easy. The other day, I wanted to order goods from a well known hypermarket chain in Spain via their online system. Sure enough, I had to register an account by providing the usual information and not unusually for Spain, I had to provide either my DNI, residency card or passport number. When it came to my credit card, the site used the system whereby my bank sends me an SMS message with a six figure security code to verify that I am in fact the holder of the card. Having done all that, I thought my order was complete and I would shortly receive the goods. In fact I got an email to say that my order had been placed satisfactorily. However, when I went to the online site to track the status of my order, it showed that my data was incomplete. When I checked the small print about setting up an account it explained that, once you had provided details, you then had to send by fax or by email copies of your identity document, your credit card (showing the last four numbers) and a signed note authorising them to use your card for payment. When I queried this, I got an email confirming what it said online. I dutifully complied and sent an email with the document copies inserted. Sods law, the lady who I am dealing with wrote back and said she needed the documents attached to an email. So now I have sent the documents both attached as jpegs and as a pdf file they can read with Adobe Acrobat Reader. I have my fingers crossed that one or other of those methods works. The good side to this story is that the company are obviously keen to protect both themselves and the shopper by making sure that the purchase is genuine. The bad side is that jumping through all these hoops has been a pain in the backside. Without a modicum of IT experience not to mention a scanner and the software to produce the documents in the right format, I would have given up. I know quite a few people who would have had no choice but to cancel the order and either go to the shop or try elsewhere. Oh yes I nearly forgot, to cancel an order I’m sure you have to send a fax or an email with copies of your documents!! Winter is a trying time for farmers, even in Spain.They plant crops in autumn to be harvested in early spring and hope that the weather will be kind to them. Although planting an early crop can bring better prices it also carries risks. A spell of cold weather with ground frosts can ruin vegetables like artichokes, beans and potatoes. On Wednesday night, the temperature dropped down to the point where the delicate crops would have been frozen and thus blackened. Night time temperatures will remain low for the rest of the week. The good news for farmers is that second crops, planted to be harvested in March, should be alright. The Catalan artist Antoni Tàpies, who saw his art as a meditation on 'the void', has died aged 88. His art works have been described as 'highly intuitive, enigmatic images that have the potential to change our perception of reality'. In 2003, he won Spain's top art award, the Velazquez Prize. Tapies' early work was strongly influenced by surrealist painters like Miro and Klee. But he later developed his own style, featuring built-up surfaces that were often scratched with letters, numbers and signs. His gritty and raw art installations often included everyday items, such as his 1971 sculpture Mattress. The work featured a bedspread, which was painted with blood-like stains and ripped in the centre to reveal horsehair stuffing. Google his name and see what you think for yourselves. A very thorny subject in our house! Those who by good management or dint of fortune happened to be in England at the right time when they were of pensionable age get it but not Pam and I. To qualify for a Winter Fuel Payment for the winter of 2011/2012 you must have been born on or before 5 January 1951 and you must have lived in Great Britain or Northern Ireland on any day in the week of 19–25 September 2011*. You can't get a Winter Fuel Payment if you moved to another European Economic Area country or Switzerland and didn't qualify before you moved. But, and here is the sore point, you can continue to get it if you moved after qualifying even if that was in a previous year. Almost annually, some crackpot MP in Britain questions whether ex-pats in countries like Spain should still get this benefit but nothing comes of it. Clearly, the said MP never lived in Spain during winter! It might not be as cold as it is in Britain but it certainly feels it to us. So no help forthcoming at Casa El Willo, we have to struggle on manfully paying for our heating without assistance. After Pam reached 60 she would have got £200 per year, now that I am 65, she would get £100 and I would also get £100. That is over 238 Euros per year that would go nicely towards our winter gas bill SIGH! * Note the word ‘lived’ not ‘visited’. Even if we had been in England during that week, we would not qualify. PS In case you misunderstood me, I don't hold a grudge against those who continue to get payments now they live in Spain, I just wish we could get them as well. After a cold weekend which was made to feel even colder by a biting wind, daytime temperatures rose by 6 degrees at the start of this week. Tuesday was the windiest day with speeds of 49.9 km per hour recorded in Orihuela. On open ground at El Realango, near to Crevillente, gusts of over 100km per hour were recorded. The wind chill on mountain tops would have dropped temperatures by –40 degrees. Unfortunately the return to warmer weather was not set to last, yesterday the maximum was 12 degrees (down 5 degrees from Monday). It will continue to be cold for a while but not as cold as last weekend and without the wind, it should feel a lot milder. I know of quite a few people who forgot to bring coats with them when they moved to Spain. Lulled by the hot summers they had spent here, they thought that summer was all year round. Not so, winters can be harsh here in the Costa Blanca. Generally speaking, the weather is fine up to December with maybe the odd spell to remind you that winter is coming. January and February seem to be the worst months with rain, wind and cold snaps. Come March, things improve although there can still be odd periods where the wind picks up or we face a deluge of rain - how many Easter parades have had to be cancelled because of rain? April going into May are usually mild, a time when you can get your shorts out and wear just a T-shirt. Then of course we move on to June which is a lovely month. For those, like Pam and I who love the sun, July and August are the best months of the year. As long as you know how to dress properly and avoid the hottest part of the day, these months are brilliant. September, October and November are like spring again and then we move to December which can be either good or bad – sunshine on Christmas Day beats snow in my book! The fact that Gibraltar is still British is a running sore with the Spanish government who are now trying to up the ante by asking the British government to take Gibraltar out of talks regarding sovereignty. The contrast between Gibraltar and its neighbour is stark. Gibraltar has a GDP of just over £1 billion, growth is expected to be over 4% this year and unemployment is almost nil. Businesses in Gibraltar are booming. By comparison Spain has an unemployment rate of over 20% and expects growth this year to be in negative figures. However we must remember that Spanish workers in Gibraltar earned £43m in 2007 – the most recent data available – which would be repatriated to Spain and Gibraltar businesses imported £174m worth of goods from Spain. Gibraltar makes its money through offshore finance, tourism, its port and online gaming – and an enticingly low corporate tax rate of 10 per cent has brought businesses flocking to their shores. For certain, the people on the Rock do not want to be considered Spanish and why should they be? They hope that David Cameron will defend their rights in talks with Mariano Rajoy unlike Tony Blair who came close to conceding joint sovereignty when he was Prime Minister. It isn’t just Bigastro that defaults on payments, I read this morning of a complaint by the Green Party in Torrevieja that the company who are building the new Santa Semana museum are owed over two million Euros for the work they have completed. Although the project is included in the Plan Trust by the Consell in Valencia, it was the city council that contracted the work so it is to them that the company are making the claim. In all, nine certificates for completed work have been issued (they are waiting for the final certificate). Normally the constructor would expect staged payments following each completed certificate. The company concerned now say that they have exhausted all dialogue between them and the council and so are considering taking the case to court. However, as we know from reports in the newspapers, Valencia is in a worse financial state than the towns in this area so I imagine, if they do take the case to law, they will join a long list of other pending claims. This is all part of a viscous circle of debt. Since there is no longer any point in building houses, companies rely upon public works to keep going but then they find that the municipalities and regions have no money to pay for the work they commission. The companies cannot borrow money from the savings banks which are strapped for cash so they cannot pay their suppliers nor their workers and so eventually everything grinds to a halt. The companies go out of business leaving half finished building projects which are just an eyesore. The new museum in Torrevieja has a budget of 5.6 million Euros to be paid for by Valencia and was supposed to be open for this Easter. Somehow I don’t think that is going to happen! My neighbour Eladia tells me that I do not need to be wary off their two dogs, Luka and Nero. They may bark a lot when people go past the house but nothing more. Actually the two dogs are a delight. They come to the gate to greet Pamela and wait for a word or two and a stroke. Strangely, the dogs seem to understand both Spanish and English! Originally, there was just the one dog, Luka, who got all the attention. When Nero came along, he tried to push Luka out so Pamela had to employ both hands and try to separate them thus making sure that each got equal attention. In the summer, when it is hot, they just lie on the porch and might just look up before going back to sleep. I have said it before but it does bear repeating, the family that live across the road from us are some of the best neighbours we have ever had, they are just such wonderful people. In fact, all of our Spanish neighbours on Calle Irlanda are good people who we get on well with. A 35 year old man and a 30 year old woman were admitted to Alicante General Hospital yesterday after being bitten by a dog. The wounds are described as serious and the owner of the dog faces prosecution even though one of the victims was his daughter. The man was working clearing the garden in the rural cottage just outside Alicante when the dog became very aggressive, broke free from the rope that was holding it and bite his right leg and left forearm. The daughter tried to stop the dog and she too was bitten several times on her leg and arm. The two of them tried to escape by getting into a van but the dog managed to follow them and bite the man again on his right foot. Finally they managed to escape and called the security forces. Eight policemen along with members of the Canine Unit arrived and managed to sedate the dog which has now been impounded. The dog in question has been described as a cross breed and was five years old. Presumably, it was being used a a guard dog by the owner and so was only doing what it was supposed to. Certain breeds of dogs have a naturally aggressive nature and no matter how placid they may seem to be, there is always the possibility of them turning nasty. There are countless cases of people being attacked and in some cases killed by so called pets. Pit bull terriers, Staffordshire bull terriers, Rottweilers etc, I would not trust any of them. I’m even wary of some German Shepherds. The desalination plant at Torrevieja was supposed to be the ‘jewel in the crown’ and the answer to the shortage of water in this area but it has stood idle since completion. The issue was the last piece of the jigsaw - the two giant pipes needed to bring water to the plant from the sea and then return the waste water back. The port is managed by the Department of Infrastructure who were demanding too high a price to the State Corporation Mediterranean Basin Water SA, the company that developed the plant. Now, five years after work began on the largest desalination plant in Europe, an agreement has been reached. The company will pay 1.2 million Euros per year, an estimated 5% of the revenue, to the Government in exchange for access. Work began on the 25th of January with eleven trucks a day bringing rock from a quarry in Murcia to build the platform on which a reinforced concrete box will be constructed to house the tubes. The whole structure will then be covered with a boardwalk which will stretch out to the lighthouse. Although the constructors are working flat out to try and complete the work as quickly as possible, it is likely that there will be disruption on the Castaway beach during the tourist season. The main hold up to the work was of course caused by a political clash between the socialist Government and the conservative controlled Generalit in Valencia with the government opposing the plant on environmental issues. This area has, for some time, relied upon transfers of water from the Tajo to the Segura via the pipelines which run the other side of Orihuela. The regional government of Castilla-La Mancha have always opposed that arrangement which had to be renegotiated each year. Once the desalination plant is complete, it will be capable of producing 80 hectometres of drinking water per year which will mean that the area will no longer be reliant upon the Tajo/Segura transfer. We have a number of candles in the lounge/dining room; on the coffee table, in the fireplace and on the dining room table. Mostly they are there for decoration but occasionally we need to use them for light. Yesterday evening, just as we came back to the house at a few minutes after 8pm, the electricity for the whole of Villas Andrea went off. it had happened twice already during the daytime and on both occasions the power returned within seconds. Last night though the power stayed off for over an hour. It came back on and then went off again a couple of times more but only for a few seconds. We have no idea what caused the problem but it was a pain in the backside because a) it delayed our evening meal and b) it stopped the television box from recording Boardwalk Empire. Each time it happens, not only are we plunged into darkness; the television box has to reset itself, the Internet router has to reset itself, the Voip phone has to reset itself and we have to reset the clock on the oven because that won’t work if the clock isn’t set. To be honest, I don’t bother setting the time properly on that clock anymore – just set it to zero. My next job, when it gets light, is to find out which of the pots on the roof has moved because every time the wind gusts hard something rattles on the roof terrace just above the bedroom. Not a huge problem in the daytime but it is at night when it wakes me up. Life in Spain is mostly ‘Esto es Jauja’ but not always! Even though it was well outside of living memory, the earthquake of 1829 which destroyed Torrevieja and killed 389 people still has a profound effect on people’s perceptions of earthquakes in this area. So, when the earth started to tremble in Torrevieja yesterday at 5:43 in the morning, people went outside as a precaution. The first signs were apparently a loud noise which increased until it sounded like thunder. In some cases, furniture inside houses moved. Luckily there was no damage reported and no casualties. The quake, which measured 3 on the Richter scale had its epicentre 3kms off the coast of Torrevieja and was 11kms under the sea. The effects were reported to be felt in Benijófar, Rojales, Los Montesinos, Almoradi, Benejúzar, Torrevieja, San Miguel de Salinas, Algorfa and Crevillent. Torrevieja is in one of areas of greatest seismic activity in this region and often has minor quakes of up to 3 on the Richter scale. Some say that a series of minor quakes is good because it means the earth is shifting a little at a time rather than building up to a larger 5.1 quake like the one in Lorca, 11th May 2011 which was only 1km below the town. Roads closed in Spain for snow! Not to be outdone by other countries, there has been some snow in the interior of Alicante province which has closed a few of the roads. In Alcoy, Biar, Ibi and Xixona there have been significant snowfalls creating problems for motorists. The CV-780 between Alcoy and Benifallim has been closed along with the road between Elda and Monóvar. Driving through Muro de Alcoy, Ibi and Banyeres de Mariola and surrounding areas is also described as tricky. DGT recommend care when driving in these areas, be on the lookout for snow and ice sheets. Me - I am going nowhere near those places! Looking at the three day weather watch in the left hand sidebar you may be thinking that the cold weather is going to be over with but the long term forecast tells us something different. By the middle of next week the lull of warmer weather will come to an end and we will be back to single figure daytime temperatures and cold nights again – sorry! And in the other departments will be Rafael Simancas (Training), Juan Moscoso (European Union), Marisol Pérez (Cooperation and Immigration) and Carmela Silva (Emigration). The Executive will also have twenty members : Eduardo Madina, Jaime Lissavetzky, Emiliano García Page, Sergio Gutierrez, Carlos Perez, Carolina Darías, Jose Zaragoza, Francina Armengol, María Teresa Noguera, José Miguel Rodríguez, Esperanza Estévez, Alejandro Soler, María Gámez, Javier Fernández, María José Fernández, Carmen Montón, Maite Fernandez, Maru Menéndez, Pachi Vázquez and Dolores Gorostiaga. All smiling faces now, let’s see how they look in just over three years time when they face the vote. The kitchen door to our house is made of aluminium* and has vents top and bottom. They are there because we have gas; not necessary for the boiler which has a balanced flue but if we had a gas hob then they would be essential (there are no air bricks in the kitchen). Since our hob and oven are electric, in winter I cover the vents with pieces of foam rubber. That stops the wind blowing through and prevents the hot air from escaping. However, even with the foam in place, the wind from the west was still howling through the door. At night we had to turn the television up to drown the sound out. It has been like that for over seven years but not any more. One night, when the wind was howling through the door, Pam pushed her foot against the bottom of it and miraculously the sound stopped. Although there is a rubber seal all round, the bottom of the door is slightly out of line and so the seal was not effective there. So, on my next trip to the ferrateria I bought a roll of one of those self adhesive foam strips and last night found the right place to apply it. Instantly, the howling stopped and peace returned to Casa El Willo – great result. It has only taken me seven years to work this one out, just think what I might accomplish over the rest of my life! * In case you are thinking – aluminium door – that is easy to break into; we have a steel security gate outside it which has been heavily reinforced with extra locks, bolts into the brickwork and industrial strength hinges. Our teacher told us that, before the housing boom, the area of the Vega Baja was dedicated entirely to agriculture. It was the lure of rich pickings from selling houses that drove owners to sell their land and young people to working on building instead of in farming. The fact that, once you have sold your land that is it, the income from it has gone did not seem to matter because there was still plenty of land left to sell. Everyone hoped there would be a never ending stream of buyers for the houses they planned to build and for a number of years that was true. The two things that killed off the dream though were greed of the constructors who thought they could continue pushing their prices up and of course the economic crisis. Both of which mean that, those of us who bought during the boom years, have seen the value of our investments plummet as house prices returned to 2002 levels. It wasn’t just constructors who became greedy, all the allied industries (carpenters, electricians, painters etc) also wanted a piece of the action and with their new found wealth, they bought expensive cars and big houses. Life was good in the Vega Baja; people who had faced poverty for years were suddenly rich and they took to new money like ducks to water. However, as fast as the boom developed, it came to a halt. The market for new houses stopped almost overnight leaving the construction industry with large tracts of land which they had bought up in preparation for building more houses. At least they had assets, the allied industries were left with nothing but what were the companies to do with the land they owned? The savings banks had taken a big hit on loans for construction and were no longer in a position to lend money for further developments. Although on paper, the companies still had huge assets in the land they owned, they no longer had the cash to develop it. In the last couple of years, some of the construction companies that survived the economic crisis have decided that, since there is no point in building, they might as well use their land to grow crops instead. You can see the evidence of this in the areas of land that would have been covered in houses but which are now planted with artichokes, lemons, onions, broccoli, oranges and lettuce. Of course the returns are not as great but using the land in this way is at least profitable and there is the added bonus of creating employment. The Vega Baja may well return to the situation our teacher told us about, an agricultural area where people do not become millionaires overnight but enjoy a life that they were once happy with. In years to come, when the economic crisis has resolved itself, there may be a need for more new housing. Hopefully though, the Vega Baja will have learned the lesson and will not rush headstrong into a construction boom again; rather it will stick to what is knows well. Land used for agriculture may not bring the same returns but at least the income from it is year on year; whilst the demand for new houses fluctuates, the need for food remains constant. What is in store for those of you planning to go to the Medieval Market today or tomorrow? There are lots of things to buy and did I mention, there is lots of food to eat. You will find all these pictures and more in my Flickr album. The Gürtel case filled the front pages of newspapers in the region for some time. The allegation made was that the former regional president, Francisco Camps and the ex regional PP secretary general, Ricardo Costa had received gifts including bespoke suits in return for political favours. If I remember correctly, the issue was about the awarding of contracts to the promotion company, Orange Market for the Volvo Ocean Yacht Race. After the six week trial, the jury found them not guilty by a narrow 5-4 verdict. The case faltered because no documentary proof was given that showed they hadn’t paid for the clothing. Added to which, the relationship between the two and Francisco Correa, Pablo Crespo and Álvaro Pérez, alias ‘the moustache' were deemed to be ‘purely commercial'. It seems to me the case eventually floundered on a purely technical point which does not necessarily mean that the two men were regarded as being entirely innocent. In case you missed it, the Medieval Market opens today in Orihuela at midday. With 350 stalls on the 3-4km route, there will be plenty to see and spend your money on. Taking advantage of the number of visitors, Orihuela have prepared 40,000 brochures, in both Spanish and English, outlining the tourist features of the city from the gastronomy to the Moors and Christian celebrations. For more information, the Tourist Office will be open all weekend. Whilst Pam will no doubt be looking around the stalls finding things to buy for our granddaughter, I will be there with my camera, trying to get that once in a lifetime shot of something interesting. We will of course meet up for one of those roast pork sandwiches filled with succulent meat that just oozes juice and flavour. Apart from my photographs, it is all that I go to the market for! The Councillor for Culture and Library, Maria José Sarmiento Juan presented the awards to the winners of the 23rd Christmas Story Contest. PS She is the lady on the right of the photo. In October 1804, a Spanish frigate, the Nuestra Señora de las Mercedes, was sunk by a British squadron off Cape St Mary, Portugal. The cargo was gold and silver coins from Lima Peru which were being sent to Spain to finance Spain’s European wars. In May 2007, the American treasure hunter, Odyssey Marine Exploration found 594,000 of the coins, shipped them to Gibraltar and then secretly flew them on to Florida. The company claim that the coins were so scattered that they could have come from any wreck. However, since the coins were all minted before 1804 and matched the cargo of the Mercedes, the courts have now decided that the treasure trove rightly belongs to Spain and in particular to the descendants of the 250 sailors who were on board the ship at that time. As you might expect, Odyssey are appealing against the decision. They say that, if they comply with the court order to return the coins within 10 days, then they do not stand a chance of seeing the coins returned. PS Apparently 400,000 coins from the Mercedes still lie somewhere on the sea bed. Finding those would be better than winning on the Euromillions lottery. For those, like me, who were not at the Council Meeting to witness the attack on the previous council, Aurelio Murcia has outlined the financial situation the new council faced when they took over. You can read the whole article in today’s Informacion newspaper. In the article the councillor talks about bills for work that was not budgeted for being left in drawers, about council workers who had not been paid for months, about people who were paid Social Security by the council*, workers who were paid but did not have contracts, even two societies that received money but were not included in the council’s accounts. According to Aplem Consulting SL, there was no system for accounting in Bigastro, even the leaders of the Socialist party had no idea of the level of debt the town faced. The bills which total 9.45 million Euros range from one due to HV Ingenerios for 1 cent to one of 1.86 million Euros due to D-6 UTE General. Because of the inept way that the previous council settled its bills, 356,000 Euros is now being claimed in interest, in charges for returned cheques and promissory notes that were not paid on time to suppliers. Sr Murcia goes on to say that the previous council even managed to pay 96,592 Euros for bills that creditors did not claim as debts. However, in the meantime, they owed 924,000 Euros to the Treasury for Social Security and 734,000 Euros in tax. As a result, Bigastro is not receiving its monthly quota from Central Government. Council workers are owed 354,000 Euros added to which 3.2 million Euros is being claimed by the courts for unpaid works and services. There are ten judicial proceedings pending against Bigastro. The largest claim will be for the 35,000 square metres of land sold to Idearco to build an hotel, an apartment complex and golf practice ranges at La Predrera. Since it was deemed ilegal to build on that land, Aurelio Murcia says that will be an impossible case for the council to win. The total of debt on paper is around 17.2 million Euros. When you add on the further debt that could ensue from the court cases etc, the figure could be as high as 35 million Euros. Knowing the level of debt is one thing, what we really need to know is how did this debt come about. The previous council must have known how much income they would receive year on year and so how much they had to in their budget to spend. Presumably the town was solvent at one point, when and why did things change? Why did the Socialist Council embark upon expenditure plans that far exceeded their income? * There is a pun on the word that locals are spreading around. Split the word socialista into two and you get social lista referring to the list of people who were paid Social Security by the council.